As impressive as Verheyen’s pedigree may be, it doesn’t even come close to accurately reflecting the monster technique, extraordinary intelligence and imaginative creativity that comprises his signature style. Carl Verheyen is the quintessential guitarist’s guitarist and a quick Google will prove that pudding. Fortunately for we students of guitar, he is also an incredibly articulate educator with a knack for making even the most challenging material very accessible. 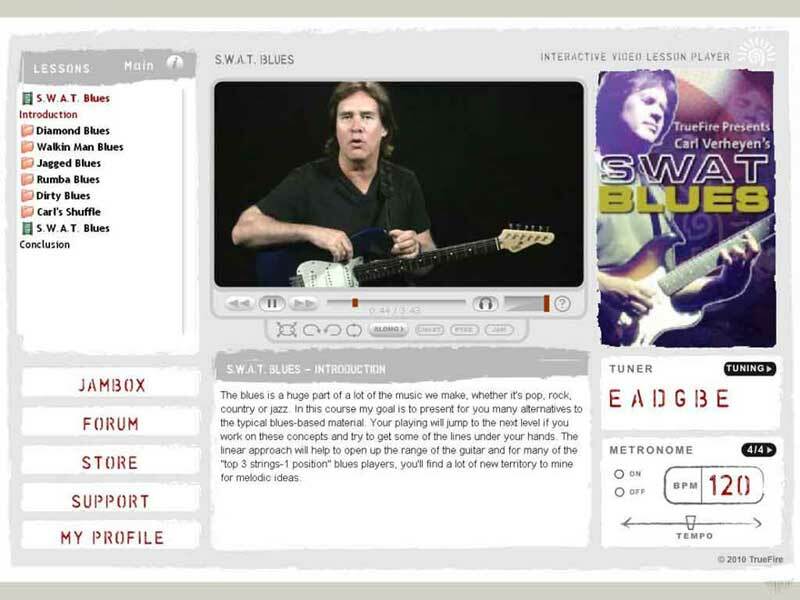 Consequently, SWAT Blues will take you deeper, wider and further than any blues course you’ve ever worked through by applying influences from bluegrass, rumba, rockabilly, jazz, rock, western swing, Texas-style, Delta-style and just about everything in between. Whatever your level of play, you will love how Verheyen steps you through his curriculum. You will work through six distinctive blues grooves ranging from low, down and dirty up-tempo shuffles to smooth and moody slow blues. Verheyen performs three solos over each groove, each solo demonstrating a distinctive approach. After each of these 18 solo/demonstrations, Carl breaks down the ‘special weapons and tactics’ utilized in the solo including intervallic lines, double-stop soloing, Myxolydian thirds, melodic chords runs, slide lick emulation, open string leaps and ornamentation, vibrato, zing harmonics, open position leaps, timing, big major third bends, modern inversions and voicings, motific and melodic development, picking-hand techniques, mixing minor and major Pentatonic lines and many more modern blues tools. You will certainly stock up on killer licks and other tricks of the Verheyen trade BUT you don’t even have to pick up the guitar to reap the key rewards of SWAT Blues; Verheyen’s concepts, creative approaches and harmonic insight alone will majorly fire up your blues bag. FAIR WARNING! All of the solos and even many of the examples in the breakdowns are transcribed, tabbed and formatted as PDFs, PowerTabs and Guitar Pro files. You also get all of the rhythm tracks to practice with. Meanwhile, you will need to move your shed to the Twilight Zone and find some serious voodoo to nail everything you see and hear in SWAT Blues in less than 30 years. But it’ll be worth it!